Hunting is a sport that many people are involved. It’s not only for the sake of recreational activity but also for the satisfaction of bringing food to the table – the hunter’s fruit of labor. Hunting is not merely just shooting prey from afar; it also involves manual effort in identifying, stalking, and ultimately, field-dressing. As you enter a gun store or any online store that specializes in outfitting, you will be amazed by the massive collections of guns ranging from rifles to pistols. As you explore them, you realize that guns have different makes, different purposes, and different shapes and sizes. 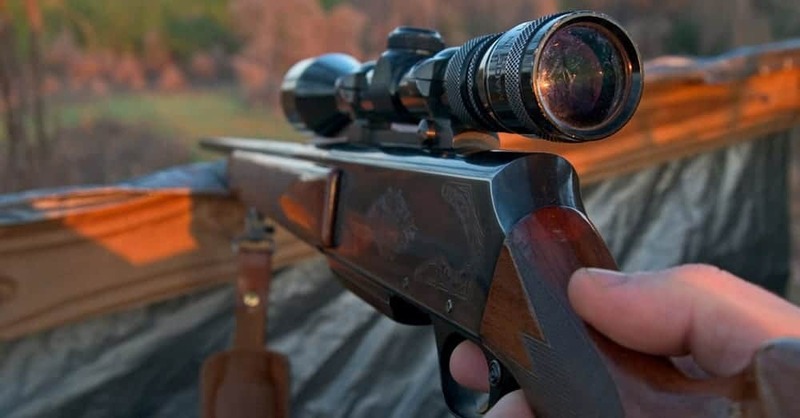 To save you time and effort in identifying what rifle could be best for hunting deer, we will help you get to know the factors to consider for choosing that particular deer hunting rifle. The Savage Arms has been manufacturing high-quality weaponry since 1894. The founder’s inventions had opened up many avenues to fellow enthusiasts to develop the firearm industry further. As of today, Savage Arms is still one of the top brands where most experienced hunters bought their firearms. Savage Arms 11 is another bolt action rifle and one of the bestsellers when it comes to deer hunting rifles. Why so? The accuracy is on par with Remington 700, another bestselling hunting rifle. There are testimonies from different hunters that Savage Arms 11 definitely fits the criteria for a perfect gun. There are many different calibers that this rifle support. Examples are .30-06 Springfield, .270 Winchester, .223 Remington, and .300 Winchester Magnum. The barrel length is long at 24 inches, and the rifles have a capacity of 4 cartridges before the next reload. As the stock is of black synthetic and the finishing is matte black carbon steel, the durability of the gun is thereby guaranteed. But due to the long barrel and the material used, the rifle is weighed to be at 8 lbs. max. Highlights for this model alone are the AccuTrigger that focuses more on enhancing accuracy and the scope used is from another renowned brand, Nikon. The scope is 3-9×40 with BDC reticle for a greater sighting. This hunting rifle is more expensive than Remington 700 though, a little more than $500. Remington is a worldwide manufacturer of guns that has been in business since 1816. At two hundred years in the market, they have sold millions of guns that are really reliable and pleasant to shoot. Some models have become bestsellers not only restricted to Remington brand alone but in the industry of weaponry. You can assure that Remington will provide you a good gun for any hunting trip. 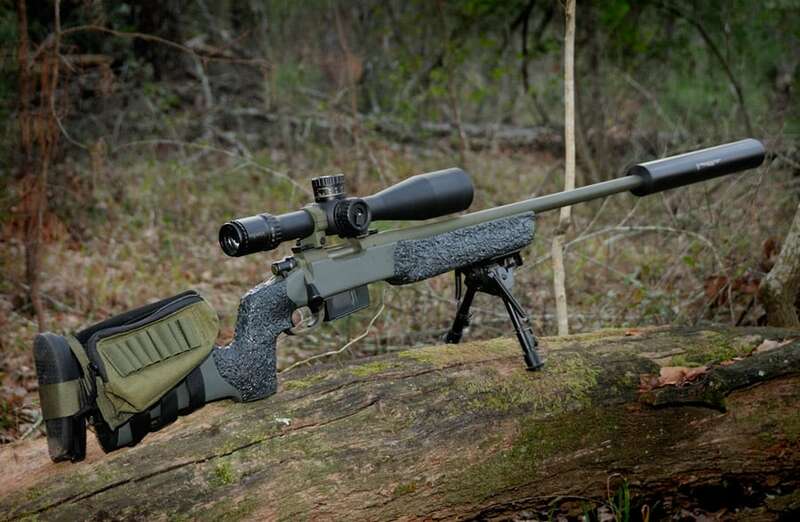 Remington 700 is a hunting rifle that is one of the favorites of hunters, and many of them testified that this is one of the best rifles that was ever produced. The first model came out in 1962 and by then, many Remington 700 models have been released, each with upgraded features. This model is a bolt action rifle that is internationally recognized for its accuracy, strength, external appearance and hunting prowess. The stock material is made of durable synthetic materials, and the finishing is of blue-black appearance. When it comes to the caliber, Remington 700 supports .243 Winchester and also .300 Winchester Magnum for four rounds. The barrel length is long at 24 inches that can fire bullets at great velocities and reduced recoils. As for its weight, it’s light at 7.25 lbs. When you buy at Cabela’s, the rifle comes with a 3-9×40 rifle scope. The scope surely increases the accuracy of Remington 700 hunting rifle. Remington 700 is a good find below $500. When it comes to Ruger, you are sure that you have invested in a quality brand that has been around since 1949. It had gone by the name Sturm, Ruger & Co., Inc. before it was changed as just Ruger. Not only hunting rifles, but they also have pistols and revolvers that are gaining popularity over the years. Featured on our list is the Ruger M77 that is a bolt action rifle. Its outer appearance is of stainless steel finishing, and the stock is made of synthetic material. The durable outer appearance makes the rifle resistant to rusting that results to durability and being long lasting. The caliber that this rifle supports is high because of .308 Winchester. Not only that kind of ammo but also others that are of .30 caliber. The detachable magazine is capable of 10-round shots before reloading. The barrel is on the short side at 16.5 inches that contributes to rifle’s lightness at 7 lbs. When you buy this rifle, instead of a scope, you have an adjustable peep sight that can pinpoint the deer’s location. Ruger M77 hunting is on the expensive side, a little below $1000. Marlin is a company that is also recognized for producing high-quality hunting rifles. Especially with Marlin 336, this has been around since 1948 and until now, it is one of the top deer hunting rifles that is most reliable in times of need. Of course, the 1948 model is now nonexistent because there have been several upgrades to cater the modern day hunters. Marlin 336 is the embodiment of good handling, balance, power, and accuracy. The rifle has moderate recoil mainly because of the barrel length at 20 inches. The rifle also supports .30-30 Winchester and .35 Remington ammo at a capacity of six rounds before you need to reload. As for the weight, the rifle is light at 7 lbs. This rifle is not a bolt action but the first of its type for this list. It is under the lever action rifles where the lever is pulled up and down to eject the spent casings. For lever action rifles only, Marlin 336 is at the top. It also has a solid top receiver that adds strength and makes it easy for the scope to mount. The rifle finish can either be stainless steel or blued carbon steel. Of course, these affect the pricing greatly with the stainless steel at more than $600 while the latter is a little greater than $500. Another product under the Ruger company is the Ruger American Rifle. It is again a bolt action rifle and the cheapest hunting rifle on our list at $400. The price is not to be belittled as the quality of the gun screams greatness. First off with the external appearance, the finishing is matte black carbon steel while the stock is made of black composite. Despite the rifle’s barrel length of 22 inches, it is very lightweight and the lightest in this group at 6.25 lbs. The calibers that the rifle supports are many, and they are .223 Remington, .30-06 Springfield, .243 Winchester, and .308 Winchester. You can fire four rounds before reloading. What sets Ruger American unique from other rifles are the following: adjustable marksman trigger, grip serrations, three-lug bolt with a short throw, dual-cocking cams for easier and smoother cycling, innovative power bedding block system that improves the accuracy greatly, and hammer-forged barrel. All these unique characteristics at less than $500! Truly a great find. What kind of animal do you intend to pursue? Answering this question is essential as there are hunting rifles that are only accurate for small games, and there are also rifles for bigger games. Another reason why you need to identify the game is because of the ammunition. It decides whether the animal you hunt will be a humane kill or a careless kill. Not all kinds of ammo can be inserted into the barrel of the rifle, so the ammo and rifle you should buy should coincide with what type of animal you will hunt. The barrel lengths are not the same in different models. In average, they range from 18 to 26 inches. The accuracy, instance, weight, and others depend on the rifle’s barrel length. It also affects the stiffness of the barrel, speed of the bullet (or muzzle velocity), and the overall length of the rifle. Hunting rifles that are on the short side when it comes to barrel length mean that they are lightweight and easier to carry when on long hunting trips. The instance of firing the bullet on a fleeing game is fast, but the stability of the rifle may become a downside. The recoil and muzzle blast can be very massive, and they are the main disadvantages of this type of rifle. For long barrels, the muzzle velocity is longer, but it is also heavier. The bullet travels longer before it exits the barrel and this results to faster speeds at longer distances. Not only that, but the recoil is lesser, so the stability is easily controlled. The rifle’s caliber can adequately distinguish if your rifle is for deer hunting rather than for varmint hunting or small-game hunting. Basically, the caliber is the diameter of the bullet. It is commonly expressed in inches or millimeters. Of course, the bullet or ammo that you should be using should always fit the rifle’s barrel. If you use a high caliber on a small animal, it would be an overkill, and you may end up not field-dressing the animal because the inside and exit wounds were so tremendous that the flesh is destroyed and not appropriate to be served on a table. 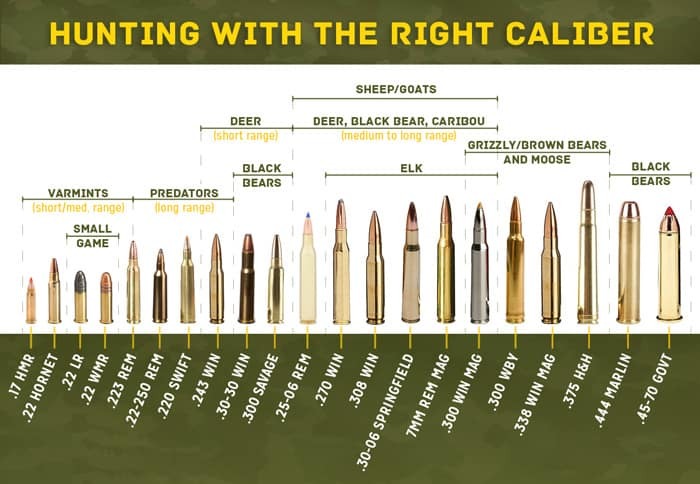 If you use a low caliber on a large animal, you might only give it a big wound, and it may suffer for a long time before its blood has fully dropped out. It’s not a humane kill at all. Hunting is not killing the animals for any reason. In selecting calibers, you should also consider the shooting range. If you like to shoot deer at close quarters, then you should be using lower calibers. If you’re more on longer distances, choose the higher caliber for a tremendous power and velocity. Many deer hunters speculate on what the best calibers are, and they all have different answers. Of course, what’s best for one may not work for the other, or it can be the other way around. For example, a .30-30 Winchester and .300 Weatherby Magnum have the same calibers, but the cartridges (or casings) are different. Though they have the same bullet size, the speeds that they travel will vary widely. Availability – The bullets are, of course, should be available in any gun stores and shouldn’t be priced too high per box. Fits to the rifle – some specific models have their own ammunition, so no worries here. Striking energy – It’s not only about the speed the bullet should travel but also the amount of power or the FPE (foot pounds per energy). It is ideal for deer to be shot with a bullet capable of more than 1000 foot pounds. The weight of the bullet is expressed in grains. 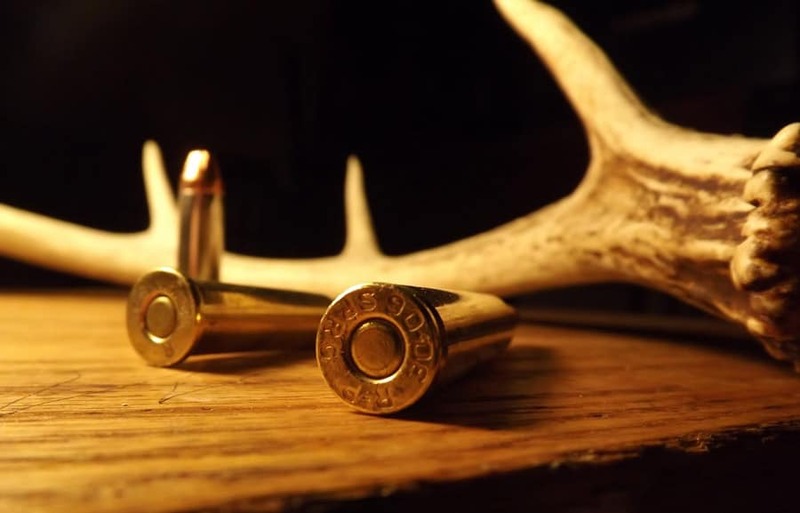 The most common bullets used on deer range from 150 grains to 180 grains. The weight of the bullet is part of the ammunition’s overall weight that consists the shell or cartridge and the bullet that separates to the former when it is fired. The bullet weight will be the deciding factor if how much would the impact be when the bullet hits the animal and is a determinant if the animal would be instantly knocked down. If it has enough penetrating force, the animal would not be able to run far or can’t escape from the scene. Placement of the bullet on the deer’s vitals is indeed necessary so that it would result in a humane kill. The action is the mechanism on how the ammunition or the cartridge is loaded into the rifle’s chamber or storage. Depending on what kind you like from the three prima types will be how many rounds you can fire in a setting before reloading. These rifles are quite popular because they are very easy to maneuver. The ammunition is loaded up into the storage, and a heavy bolt locks the ammo in place. The bolt is manually unlocked when the rifle is discharged as the bolt is brought upwards. As the bolt is pulled back, the spent casing is ejected, and the next cartridge replaces the former. The bolt is then locked into place, repeating the sequence. Many hunters also like using this type of rifle as it’s the safest and easiest to clean. The bolt can be manually removed and the passage for the chamber is then exposed. The bolt action rifle allows the hunter to store or load several cartridges at a time. It’s also popular for its greater accuracy, quietness, and easy maintenance. As for the reloading, the bolt action rifle can be the slowest. The mechanism is illustrated by the lever going up and down, each time the rifle is fired. The spent casing is ejected from the rifle when the lever is down. The next cartridge will then replace the former in its place when the lever is pulled up. This now makes the rifle ready to fire. The weakness of the lever action can be the speed as it’s not as fast as semiautomatic rifles. Also, due to the orientation of the lever when it is pulled down, the spent shell may not be automatically ejected and may cause jamming when you pull the lever back up. But lever action rifles are still popular, and they are indeed durable. As the trigger is pulled or squeezed, the bullet fired is one at a time. Semi-automatic rifles don’t have the need of manually ejecting the spent casing and then inserting a new cartridge into the chamber. The spent casing is automatically ejected out of the rifle, and the next one slides automatically. Using this rifle saves time and less effort because you only need to empty the current magazine before you need to reload. However, this kind of mechanism is prone to jams because some spent cases don’t go out immediately after firing. It is also prone to accidental firing. Of course, the weight of the rifle is important to consider when you buy a deer hunting rifle. You have to equate your long hunting trips and the length of the rifle. Generally, if the rifle has a longer barrel, it’s more on the heavy side and can be hard to walk with it weighing on your back. Many hunters prefer shorter barrels as they make the rifle lightweight, and they compensate with the given recoil and lesser stability with their superb shooting and hunting skills. This factor is closely related to the barrel length and the caliber. What you use in an open country may not be as useful in a forest with severe underbrush. This is specifically restricted to rifles with long barrels. If utilized in a forest with thick undergrowth, many times would be that you can’t get into a shooting position because the end of the barrel gets caught on something. This is not a problem for shorter barrels. In an open country, the longer barrels are apparently preferred by hunters because the bullet trajectory is more stable or flat, and because of the length, there is more than enough for the bullet to travel at greater speeds and will invoke a significant impact on the deer’s vitals. The most commonly used metals for the body of the rifle are either carbon steel or stainless steel. The durability and resistance to rusting depend on what metal is used for the rifle. For carbon steel, it is widely known that this metal is prone to rust. But there are specific methods that help retard the rusting such as the “bluing” treatment that gives the rifle a blue-black appearance. For stainless steel, although it’s rust-resistant, it is always more expensive than the carbon steel. The stainless steel is usually of silver, but it is coated with colors such as black because rifles are usually of dark colors that help with the camouflage. The stock of the rifle is a structure that the shooter typically holds when he’s in a shooting position. It supports the rifle for a more comfortable position when firing. The materials normally used for the stock are wood, fiberglass, or plastic. Wood is the most traditional stock material in the past, but the innovation of the wood called laminated wood is one of the most popular stock materials for the hunting rifles. The laminated wood is more durable than traditional wood as they resist warping and degrade due to different weather conditions. Stock materials like plastic and fiberglass are also popular and are found to be less expensive than other materials. These materials aren’t affected by the moisture and any weathering as they’re made of synthetic materials. But then, there are drawbacks like extreme temperature sensitivity and lack of rigidity. Of course, a hunting rifle is not complete without the scope or sight. It’s an absolute requirement when deer hunting because you shoot from a far distance. The accuracy is then dramatically improved with rifle scopes and with great patience and skill, you can hit the deer’s vitals in an instant. A first-time hunter, more commonly a woman, could find the high-caliber hunting rifles to be daunting and beyond extreme for her use. This is because she is not used to the recoil and the noise that the rifle produces. The recoil of a high-caliber rifle can be too much for a woman because she can’t take much of the impact. This results to many missed targets that could be disastrous if one bullet hits a bystander. The best rifle for her would then be a lightweight and low-caliber hunting rifle that has lesser recoil. This is also applicable to younger hunters. The golden rule here is that never fire a gun that you can’t control properly. Of course, when we want to buy things, we always consider the price tag before we check it out. This may be the ultimate deciding factor for hunters on a budget, but it won’t be a problem for those who are more affluent. Since rifles are different from the other, it’s not guaranteed that when it is cheaper, then it’s a lower quality. You have other factors to consider for the price aside from the brands such as the finishing and stock materials. When you choose your best deer hunting rifles, buy the one that really fits your preferences so you won’t have any regrets. You must take note that guns are definitely expensive and a wrong purchase should not be forgiven. A best hunting rifle partnered with best hunting gear and accessories, and you’re off on a hunt that you will surely feel satisfied and at one-hundred percent performance. Where can I buy a Savage or Remington rifle with a heavy barrel? Good article. I can’t argue with your top 5. The savage I own and hunt with. Great accurate rifle for the price. The marlin 336c in a 30-30 is what i grew up hunting deer with here in Pennsylvania. Great for in close brush hunting..when a person shoulders a gun it should be comfortable and feel good. No leaning or twisting to get comfortable. Then work with the caliber depending on what and where your hunting. I think it’s funny the 1st rifle you posted is a Remington 700. 20 years ago they were the best but now they are junk. Dollar for dollar Savage makes the best rifles on the planet. .308 would be my caliber of choice in a light gun.